Share these social media assets on Facebook and Twitter and tag @BreatheBetter. To use these images, right click on each one and select "Save Image as..." or click on the download button to save them on your device. For additional content, please visit our Flickr page. What Do COPD Prevalence Rates Look Like in Your State? 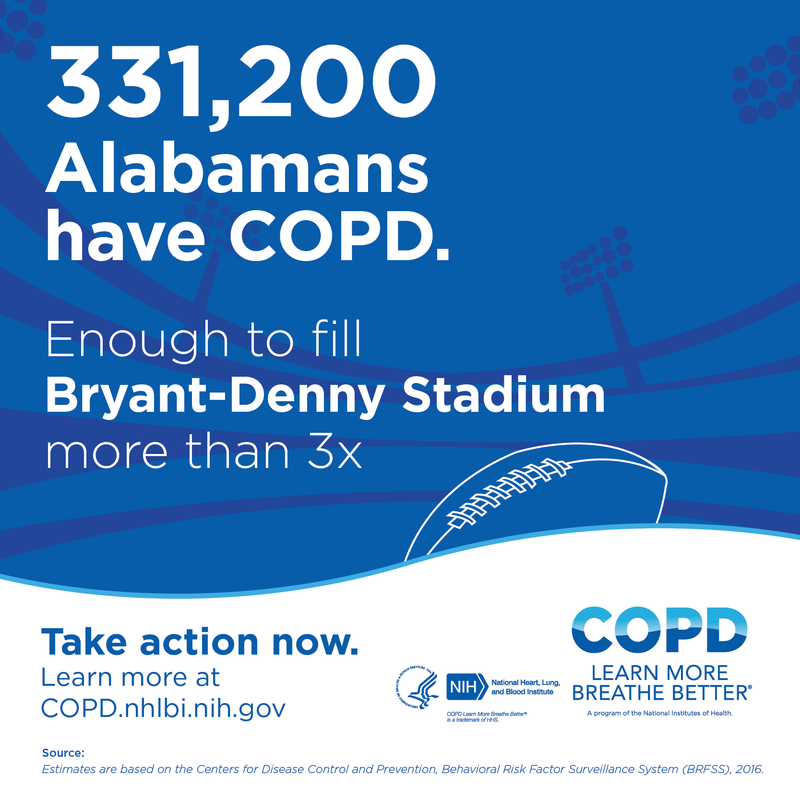 331,200 Alabamans have COPD. Enough to fill Bryant-Denny Stadium more than 3x. Take action now. Learn more at copd.nhlbi.nih.gov. 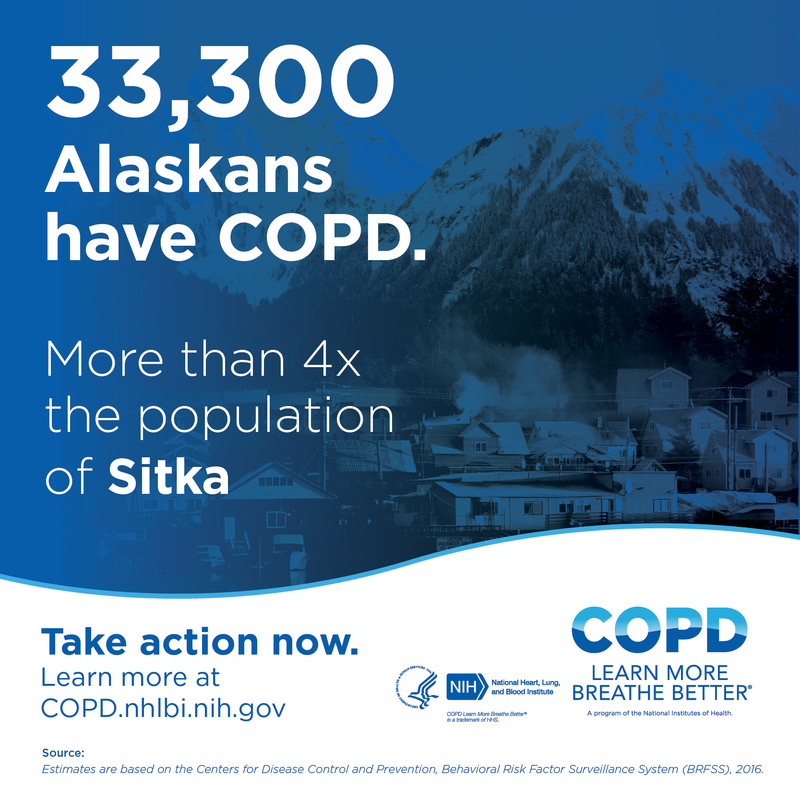 33,300 Alaskans have COPD. More than 4x the population of Sitka. Take action now. Learn more at COPD.nhlbi.nih.dot.gov. 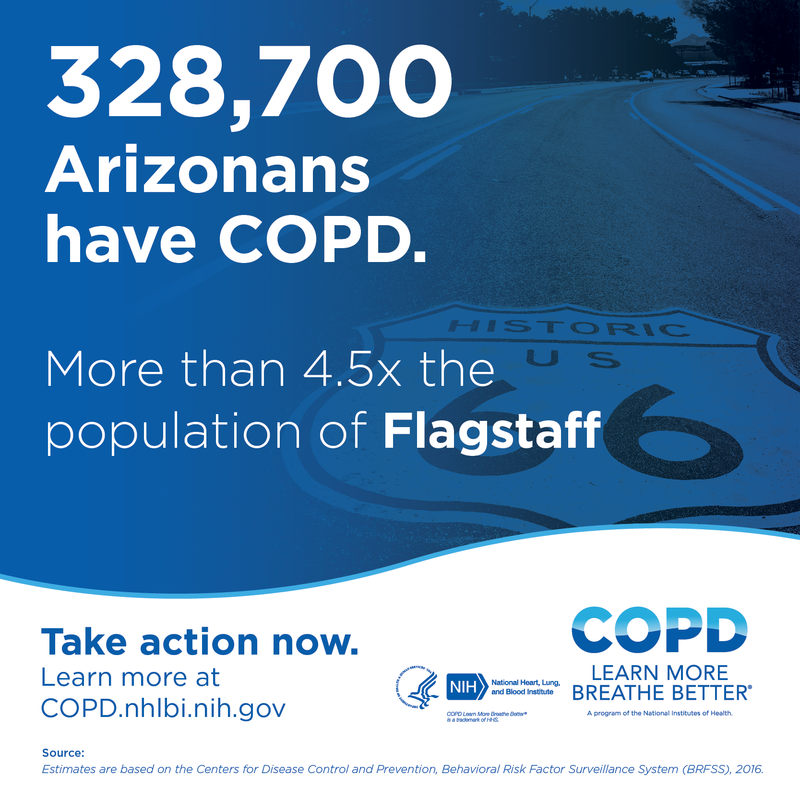 328,700 Arizonans have COPD. More than 4.5x the population of Flagstaff. Take action now. Learn more at COPD.nhlbi.nih.gov. 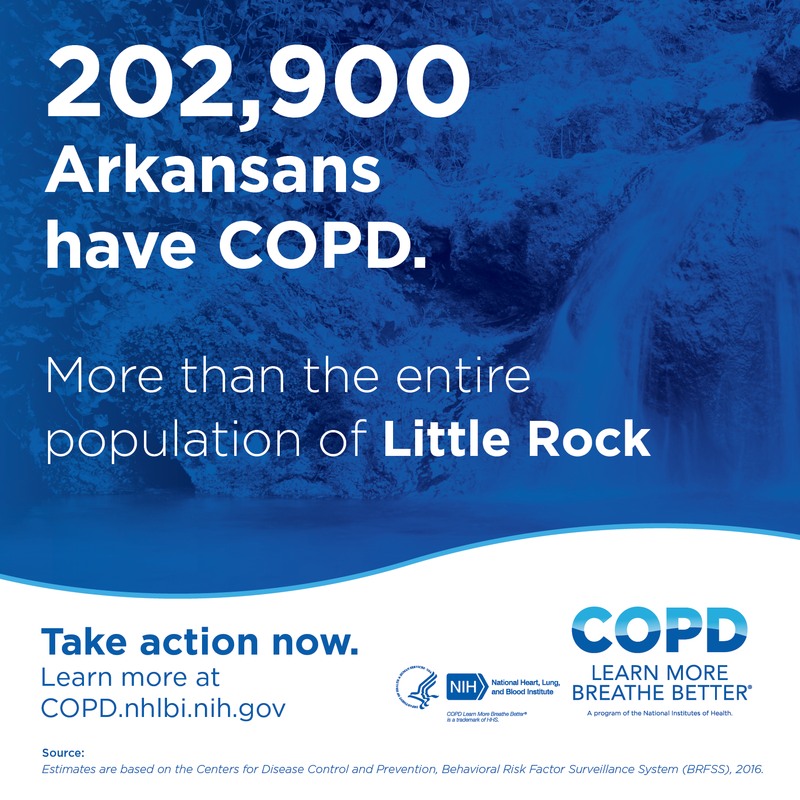 202,900 Arkansans have COPD. More than the entire population of Little Rock. Take action now. Learn more at COPD.nhlbi.nih.gov. 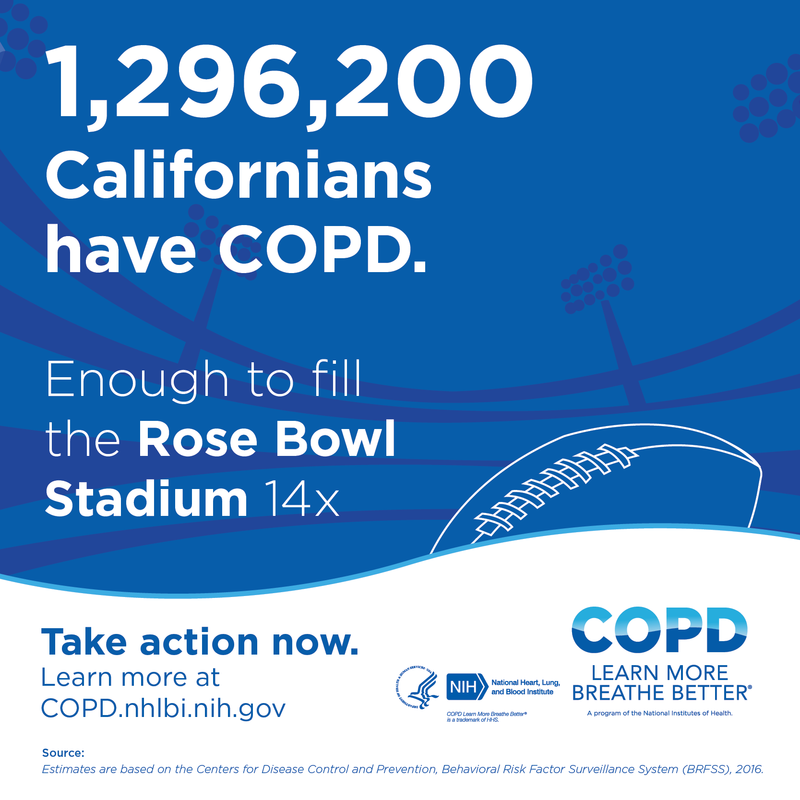 1,296,200 Californians have COPD. Enough to fill the Rose Bowl Stadium 14x . Take action now. Learn more at copd.nhlbi.nih.gov. 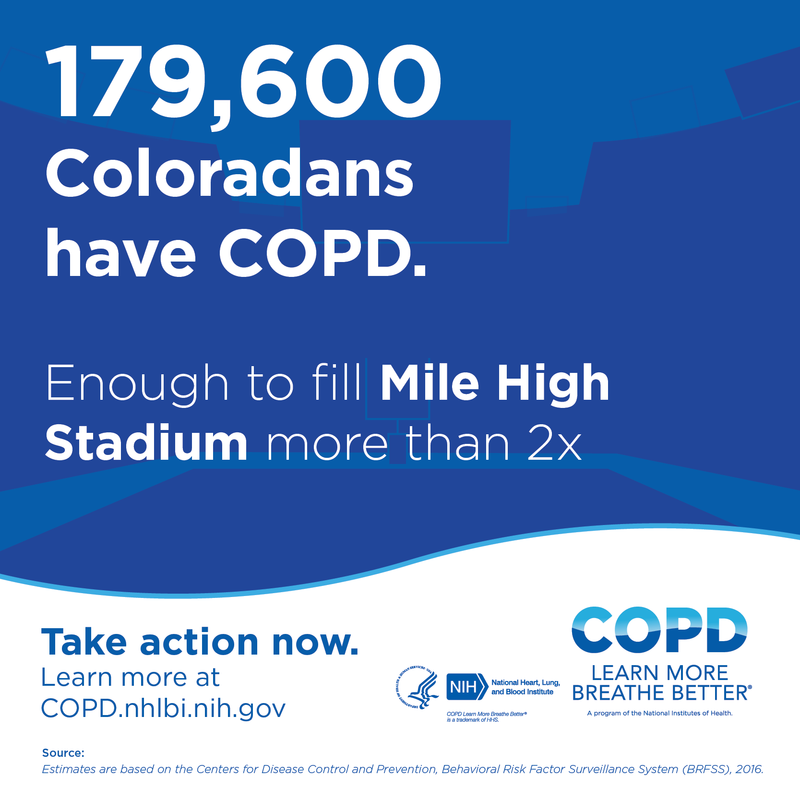 179,600 Coloradans have COPD. Enough to fill Mile High Stadium more than 2x. Take action now. Learn more at copd.nhlbi.nih.gov. 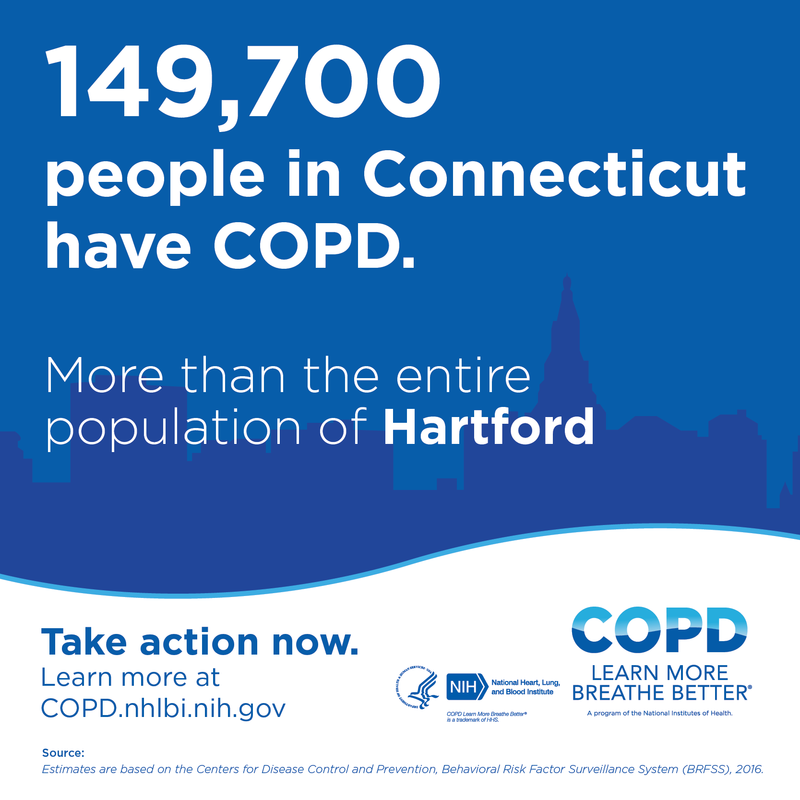 149,700 people in Connecticut have COPD. More than the entire population of Hartford. Take action now. Learn more at copd.nhlbi.nih.gov. 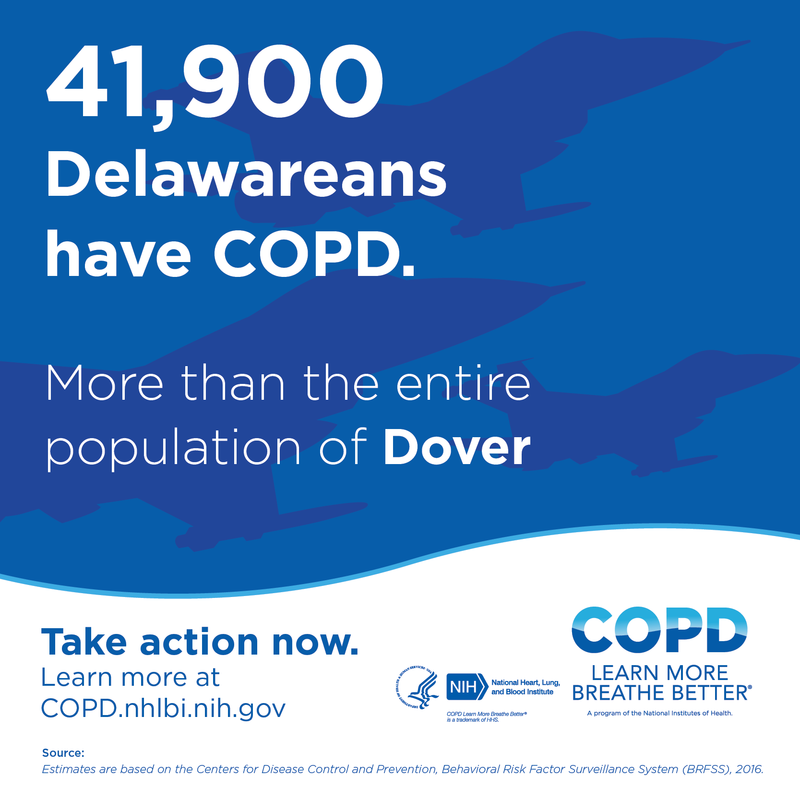 41,900 Delawareans have COPD. More than the entire population of Dover. Take action now. Learn more at copd.nhlbi.nih.gov. 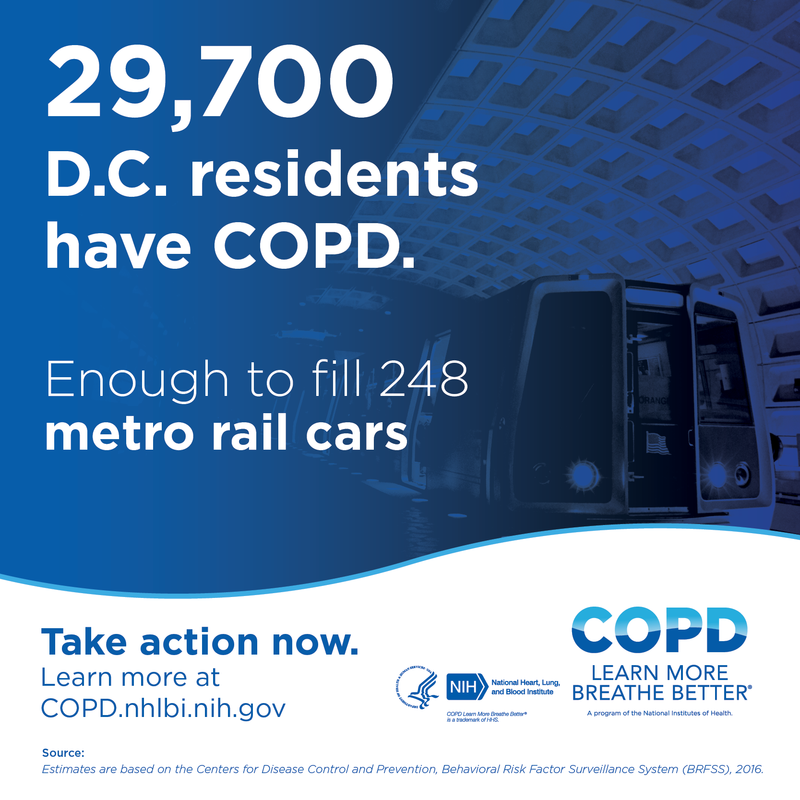 29,700 D.C. residents have COPD. Enough to fill 248 metro rail cars. Take action now. Learn more at copd.nhlbi.nih.gov. 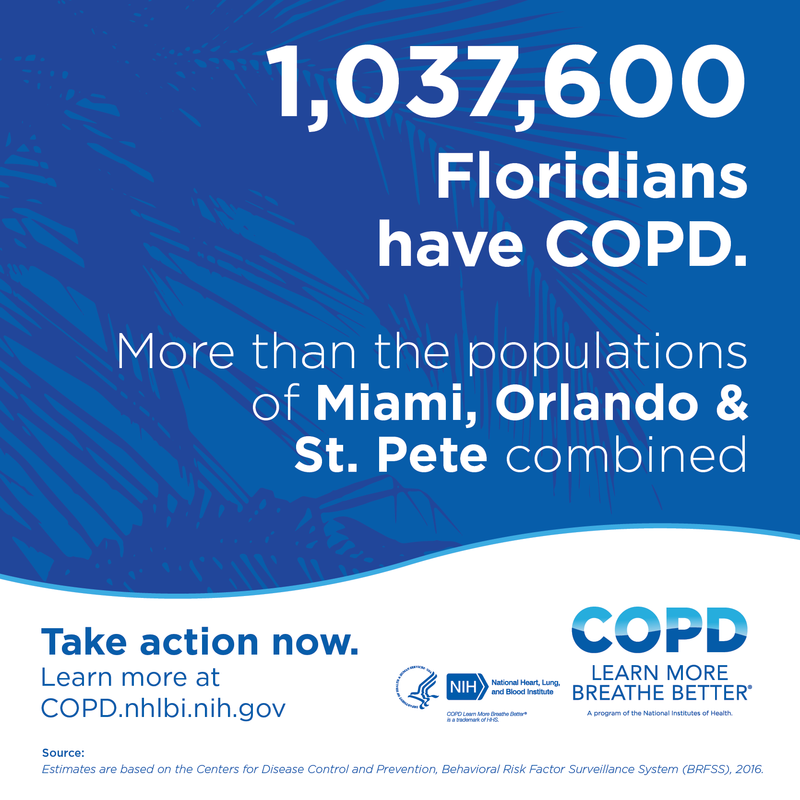 1,037,600 Floridians have COPD. More than the populations of Miami, Orlando & St. Pete combined. Take action now. Learn more at copd.nhlbi.nih.gov. 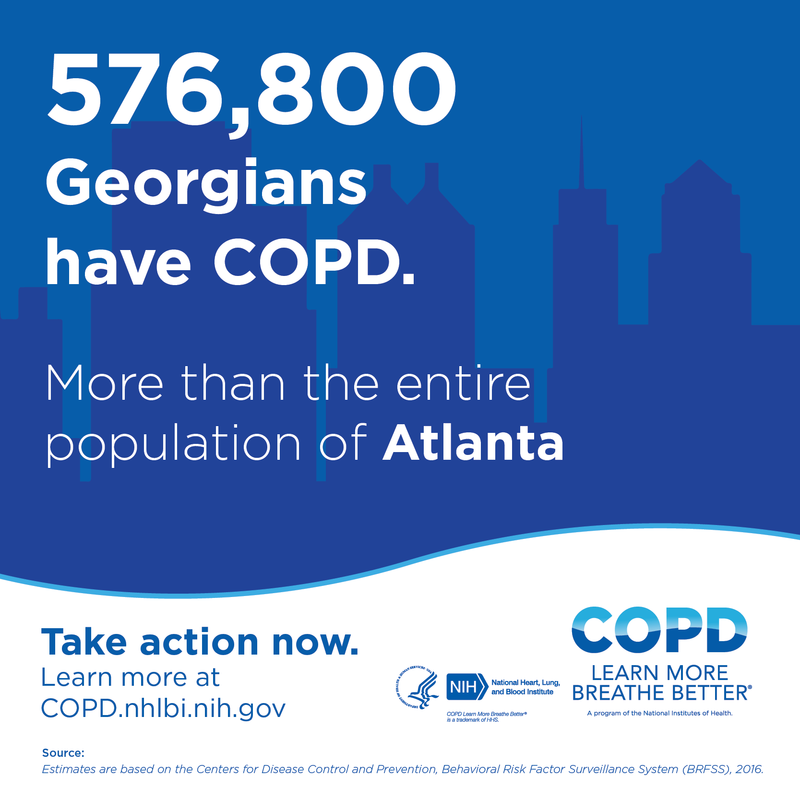 576,800 Georgians have COPD. More than the entire population of Atlanta. Take action now. Learn more at copd.nhlbi.nih.gov. 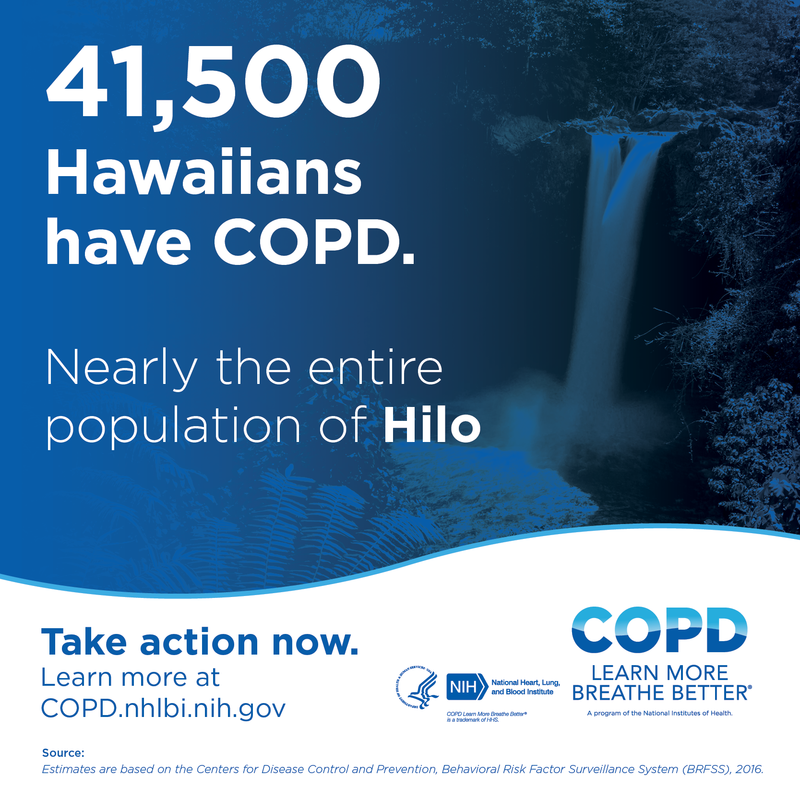 41,500 Hawaiians have COPD. Nearly the entire population of Hilo. Take action now. Learn more at copd.nhlbi.nih.gov. 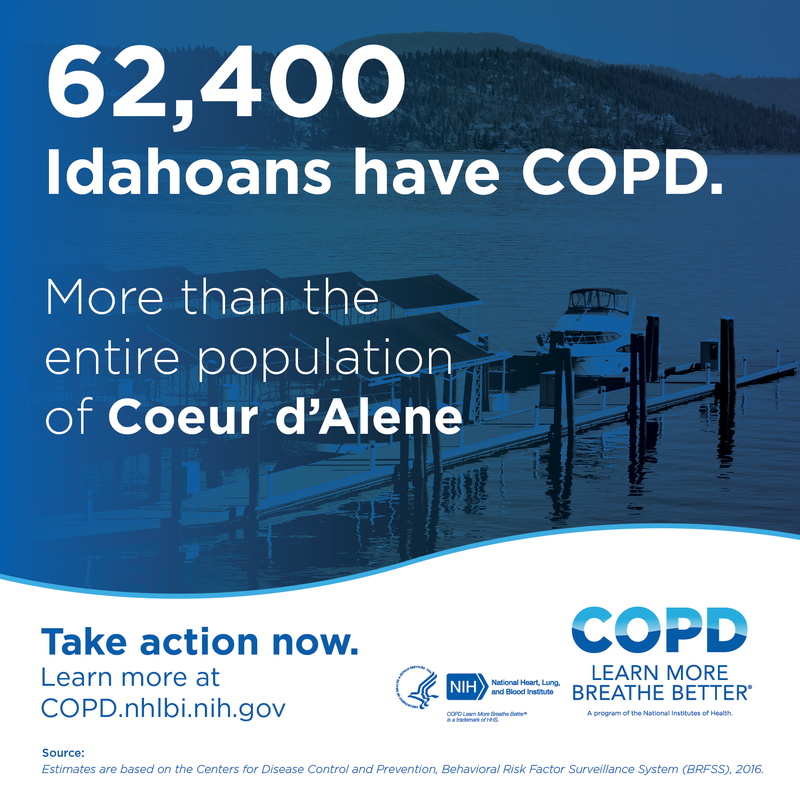 62,400 Idahoans have COPD. More than the entire population of Coeur d'Alene. Take action now. Learn more at copd.nhlbi.nih.gov. 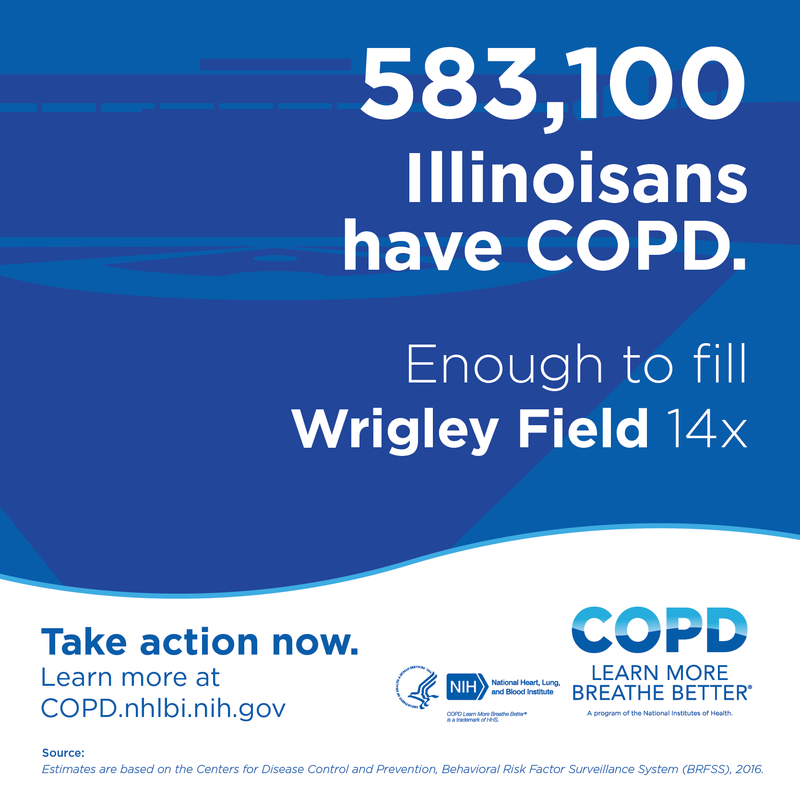 583,100 Illinoisans have COPD. Enough to fill Wrigley Field 14x. Take action now. Learn more at copd.nhlbi.nih.gov. 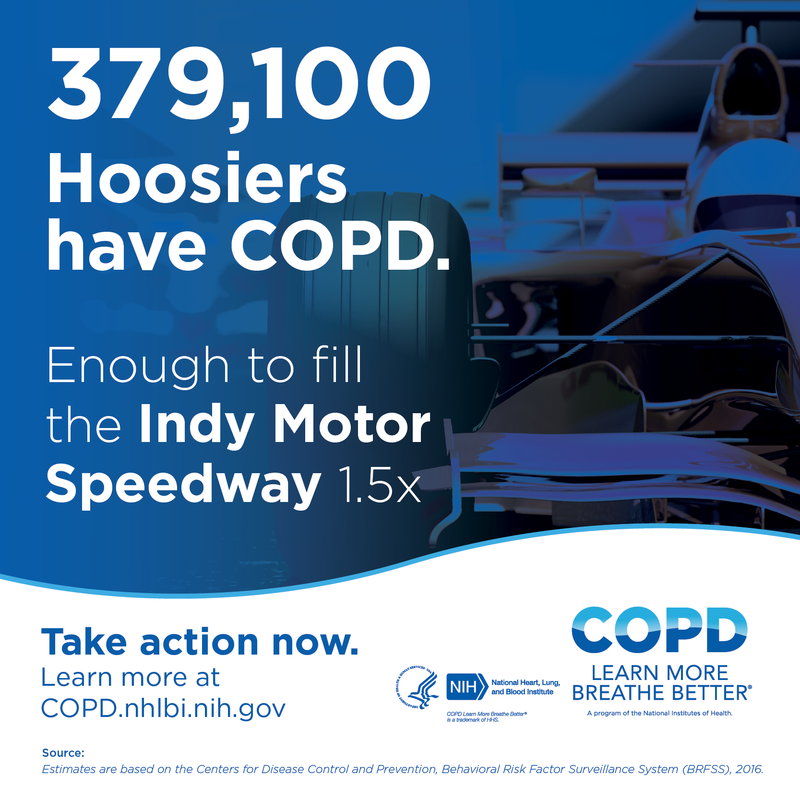 379,100 Hoosiers have COPD. Enough to fill the Indy Motor Speedway 1.5x. Take action now. Learn more at copd.nhlbi.nih.gov. 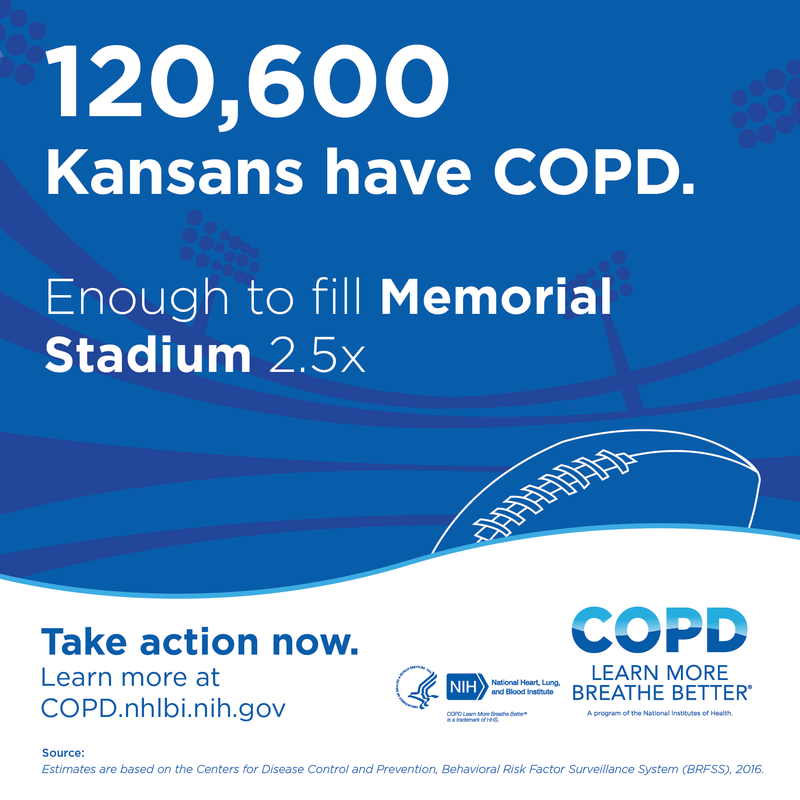 120,600 Kansans have COPD. Enough to fill Memorial Stadium 2.5x. Take action now. Learn more at copd.nhlbi.nih.gov. 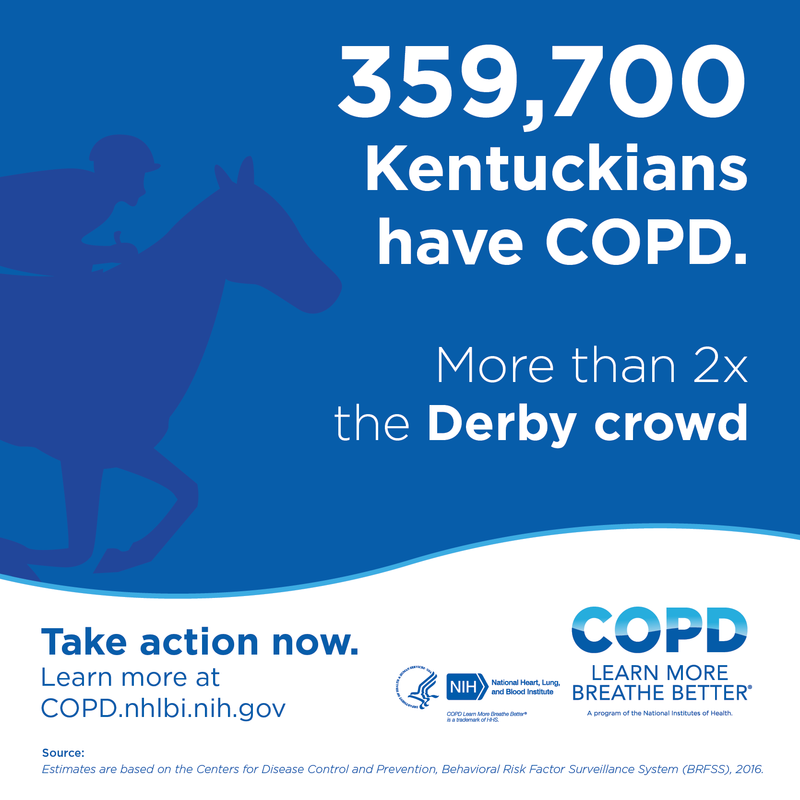 359,700 Kentuckians have COPD. More than 2x the Derby crowd. Take action now. Learn more at copd.nhlbi.nih.gov. 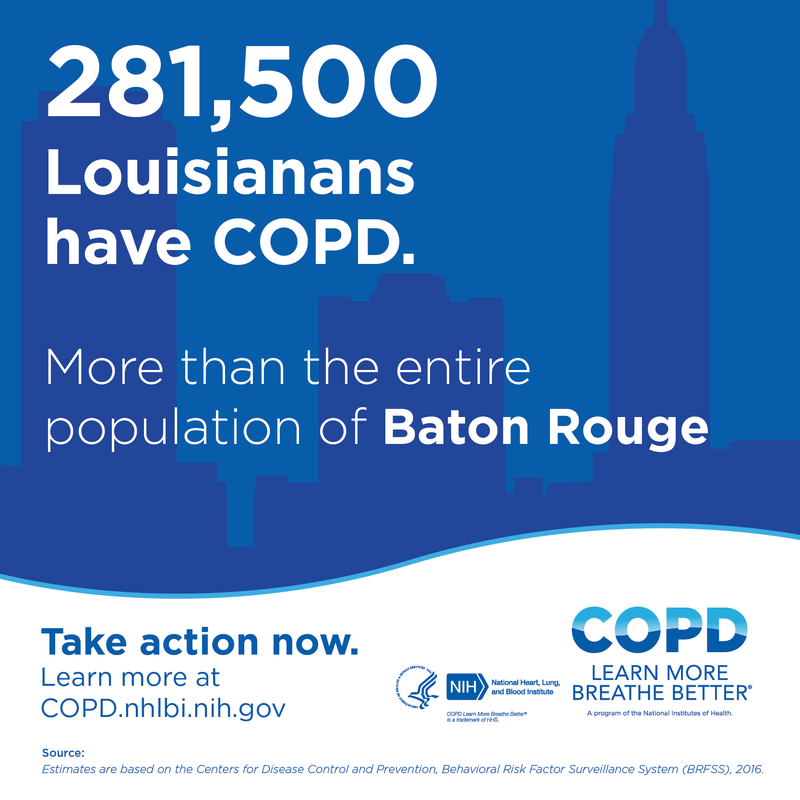 281,500 Louisianans have COPD. More than the entire population of Baton Rouge. Take action now. Learn more at copd.nhlbi.nih.gov. 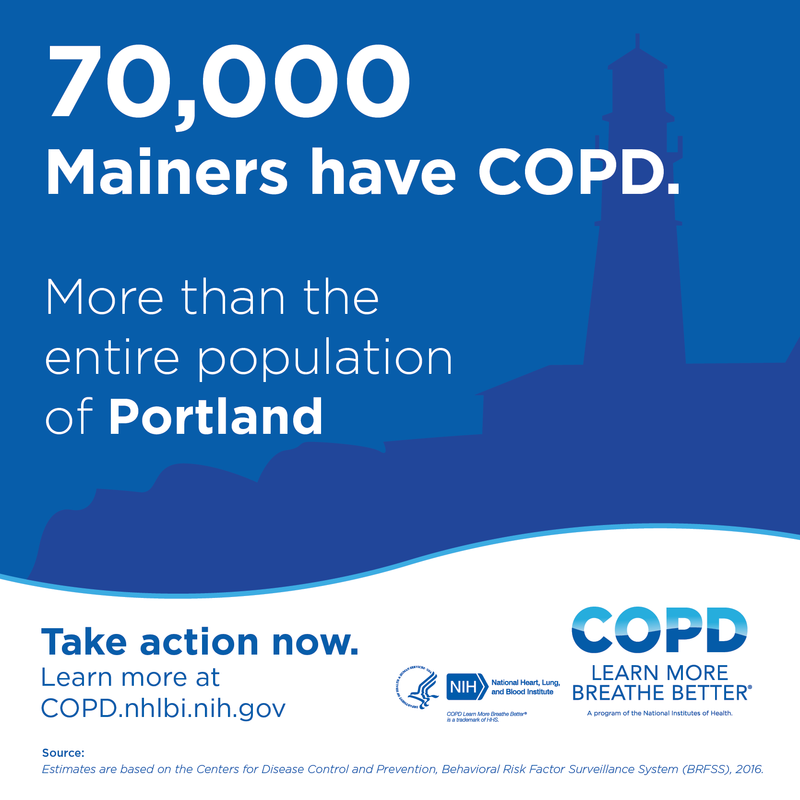 70,000 Mainers have COPD. More than the entire population of Portland. Take action now. Learn more at copd.nhlbi.nih.gov. 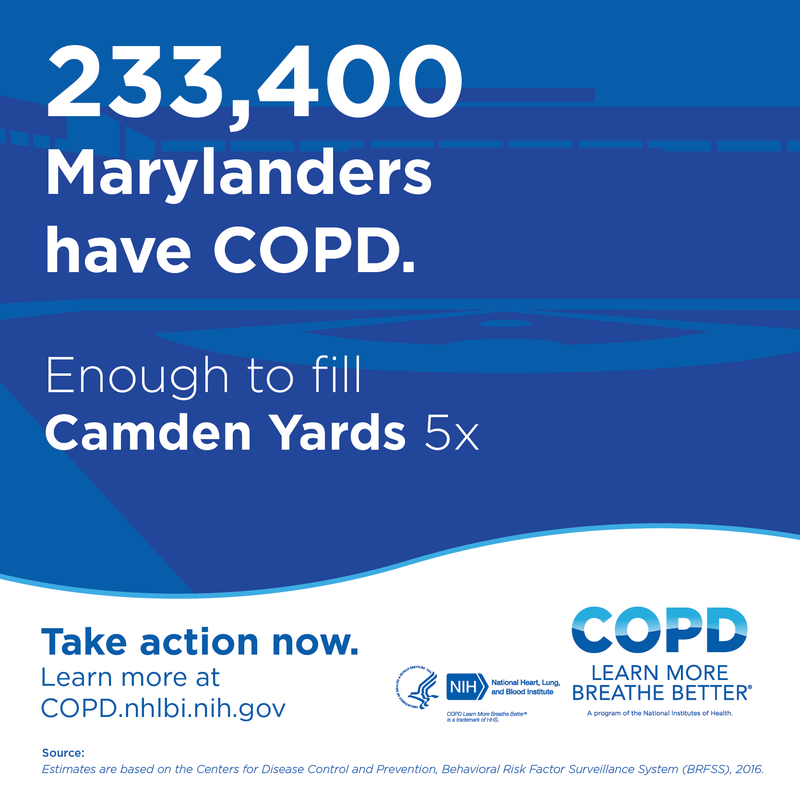 233,400 Marylanders have COPD. Enough to fill Camden Yards 5x. Take action now. Learn more at copd.nhlbi.nih.gov. 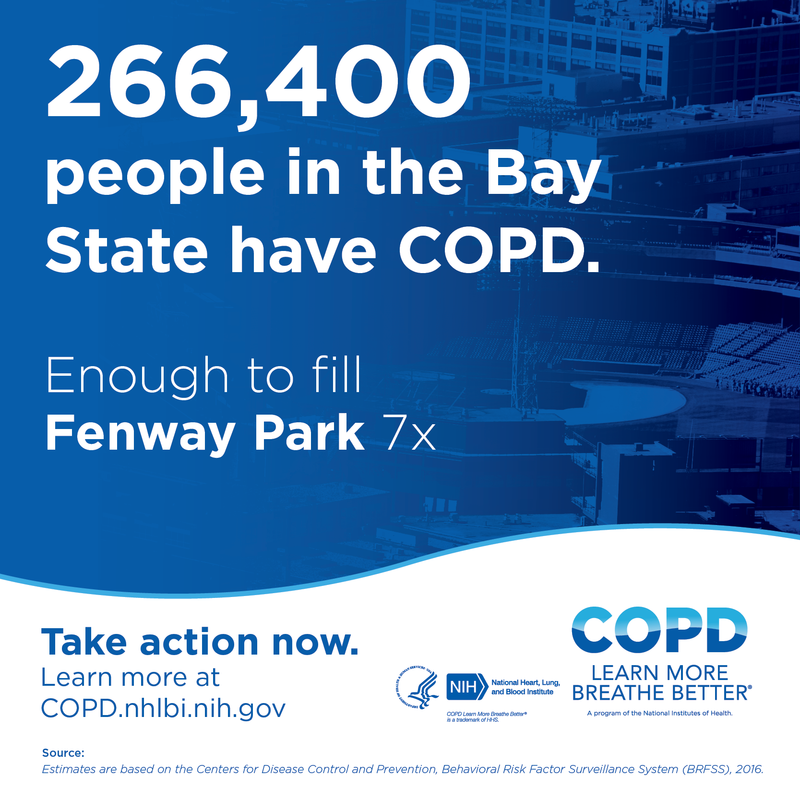 266,400 people in the Bay State have COPD. Enough to fill Fenway Park 7x. Take action now. Learn more at copd.nhlbi.nih.gov. 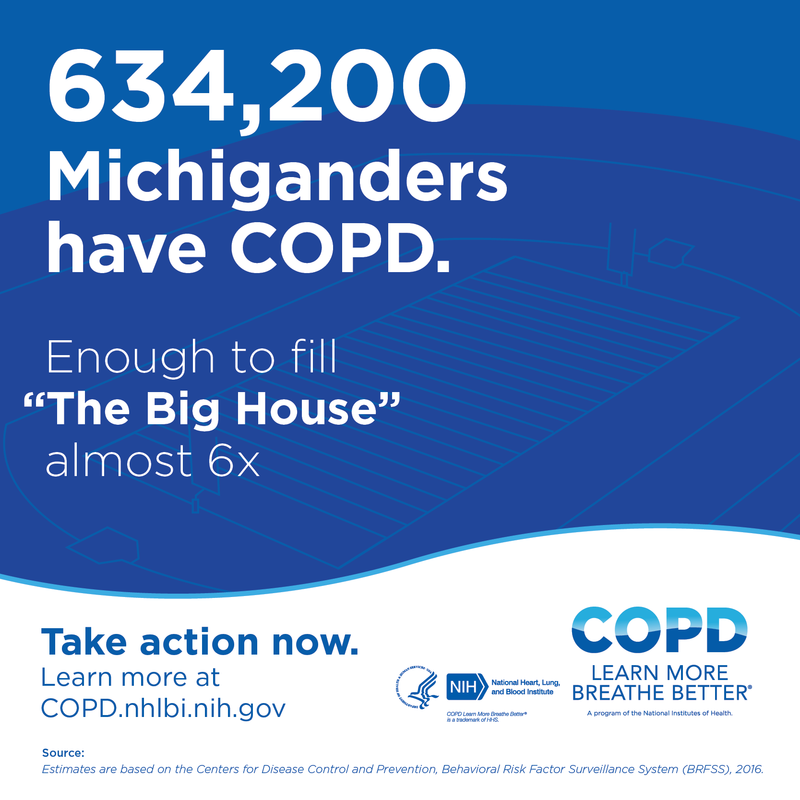 634,200 Michiganders have COPD. Enough to fill "The Big House" almost 6x. Take action now. Learn more at copd.nhlbi.nih.gov. 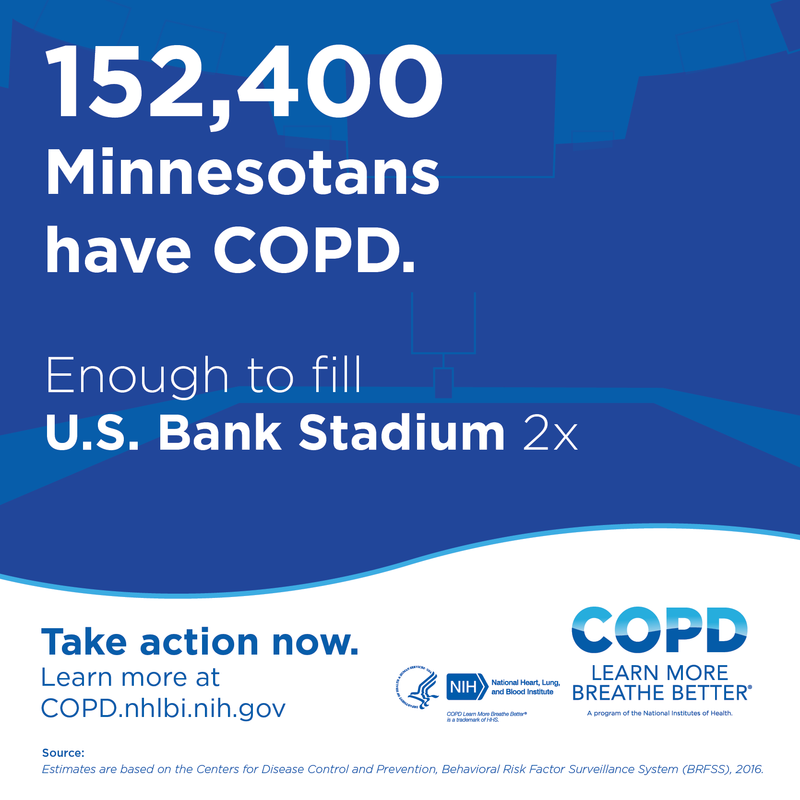 152,400 Minnesotans have COPD. Enough to fill U.S. Bank Stadium 2x. Take action now. Learn more at copd.nhlbi.nih.gov. 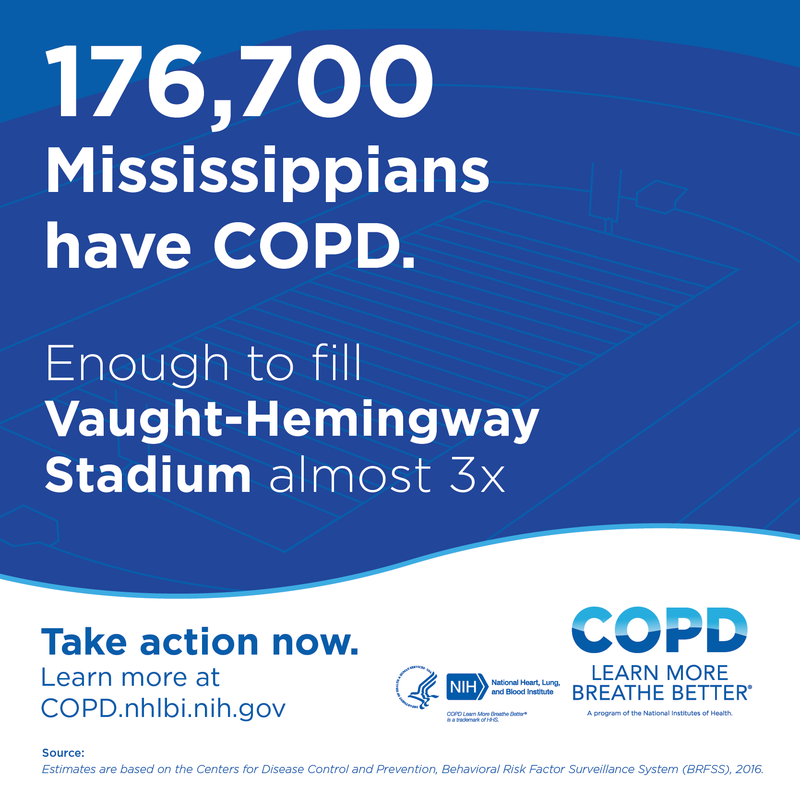 176,700 Mississippians have COPD. Enough to fill Vaught-Hemingway Stadium almost 3x. Take action now. Learn more at copd.nhlbi.nih.gov. 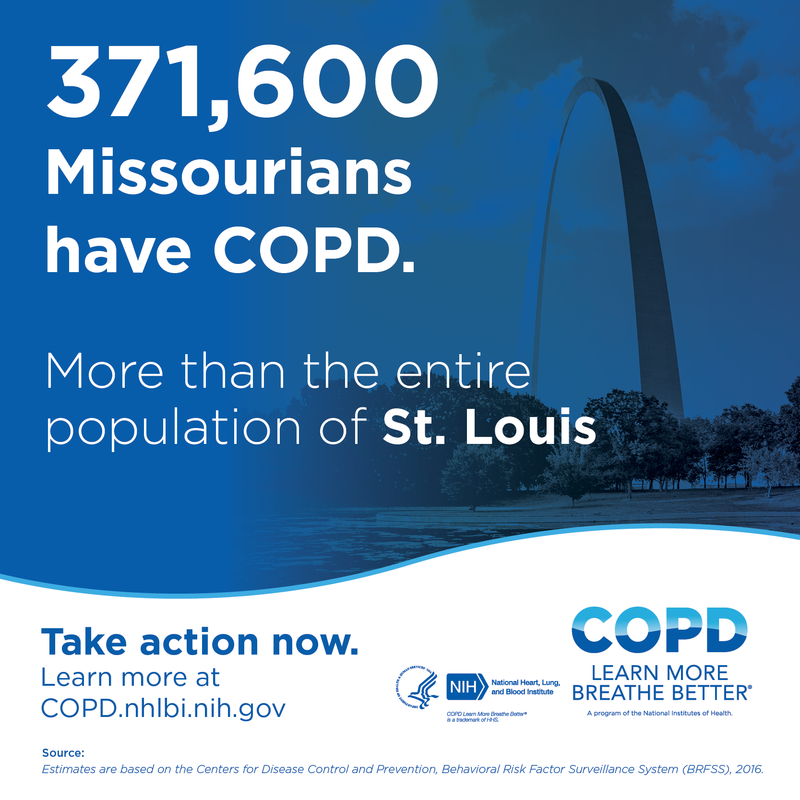 371,600 Missourians have COPD. More than the entire population of St. Louis. Take action now. Learn more at copd.nhlbi.nih.gov. 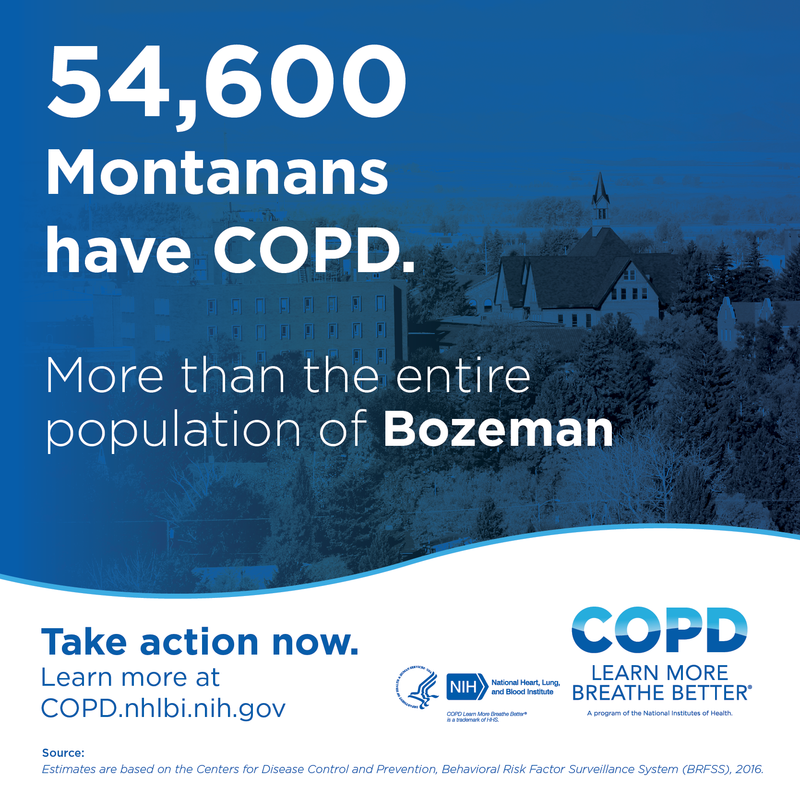 54,600 Montanans have COPD. More than the entire population of Bozeman. Take action now. Learn more at copd.nhlbi.nih.gov. 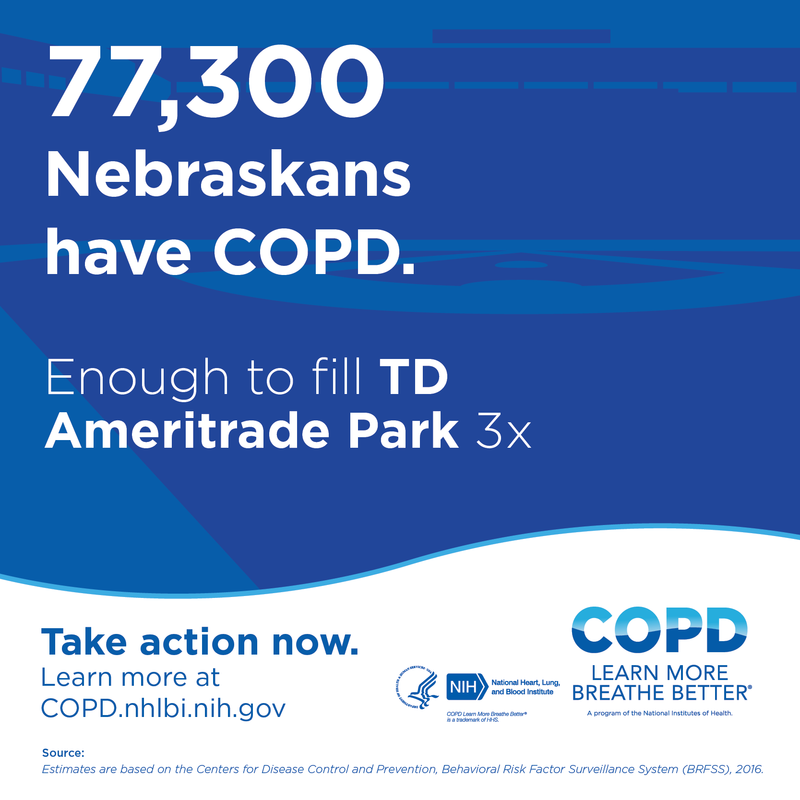 77,300 Nebraskans have COPD. Enough to fill TD Ameritrade Park 3x. Take action now. Learn more at copd.nhlbi.nih.gov. 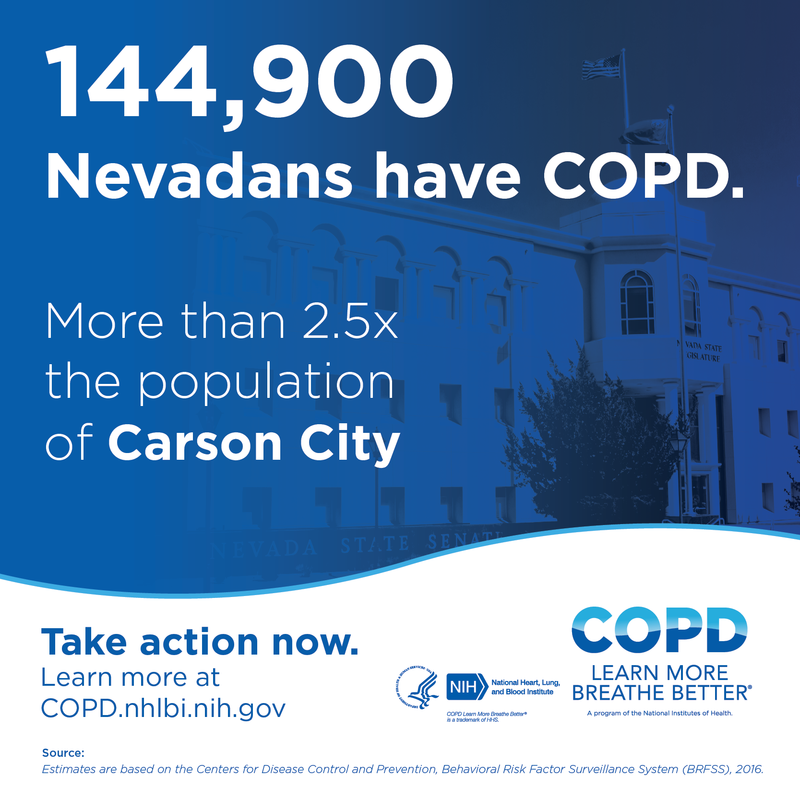 144,900 Nevadans have COPD. More than 2.5x the population of Carson City. Take action now. Learn more at copd.nhlbi.nih.gov. 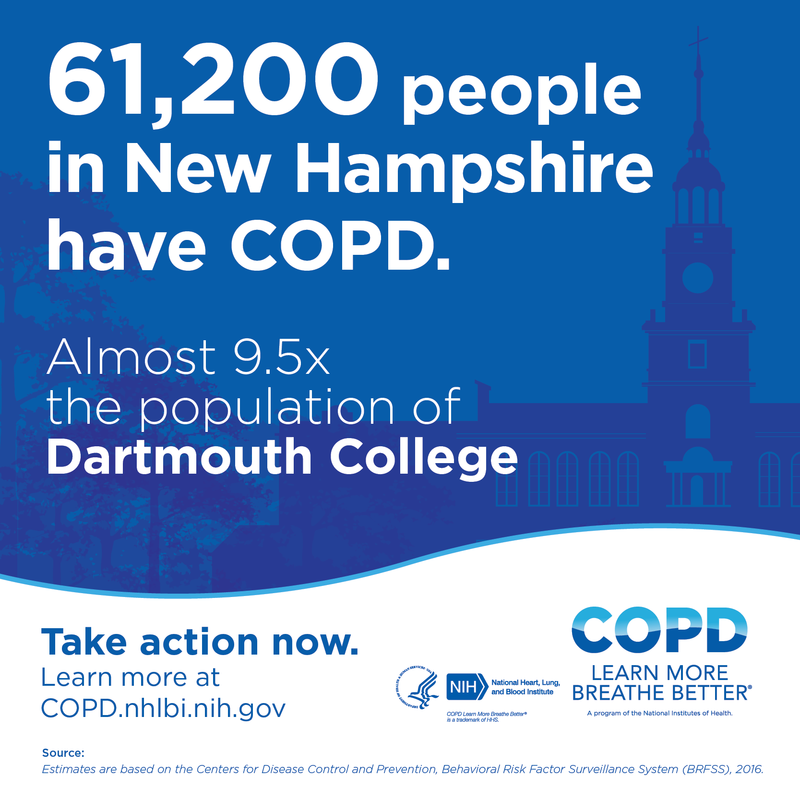 61,200 people in New Hampshire have COPD. Almost 9.5x the population of Dartmouth College. Take action now. Learn more at copd.nhlbi.nih.gov. 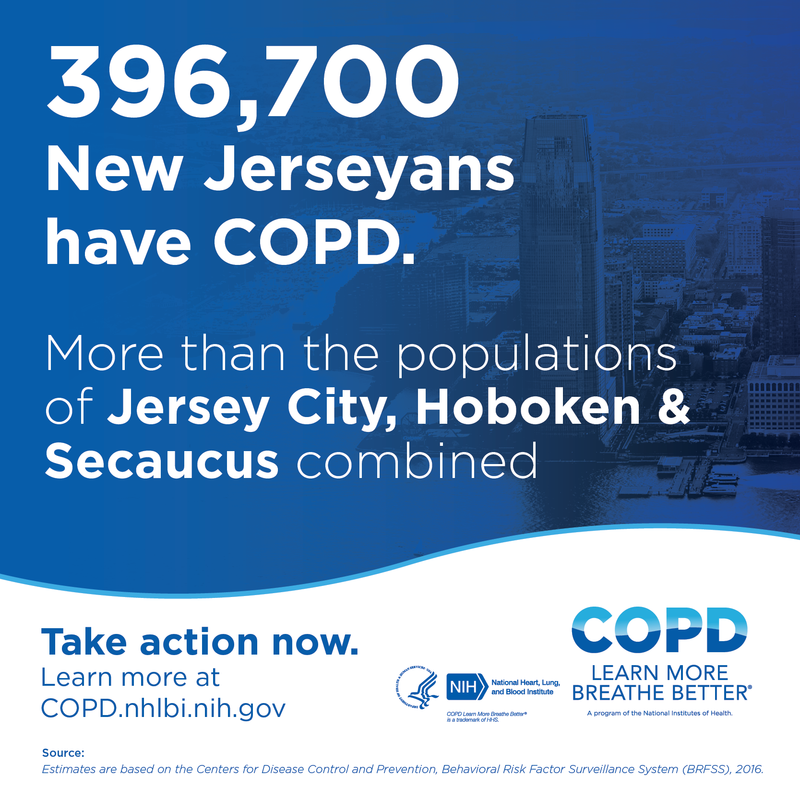 396,700 New Jerseyans have COPD. More than the populations of Jersey City, Hoboken & Secaucus combined. Take action now. Learn more at copd.nhlbi.nih.gov. 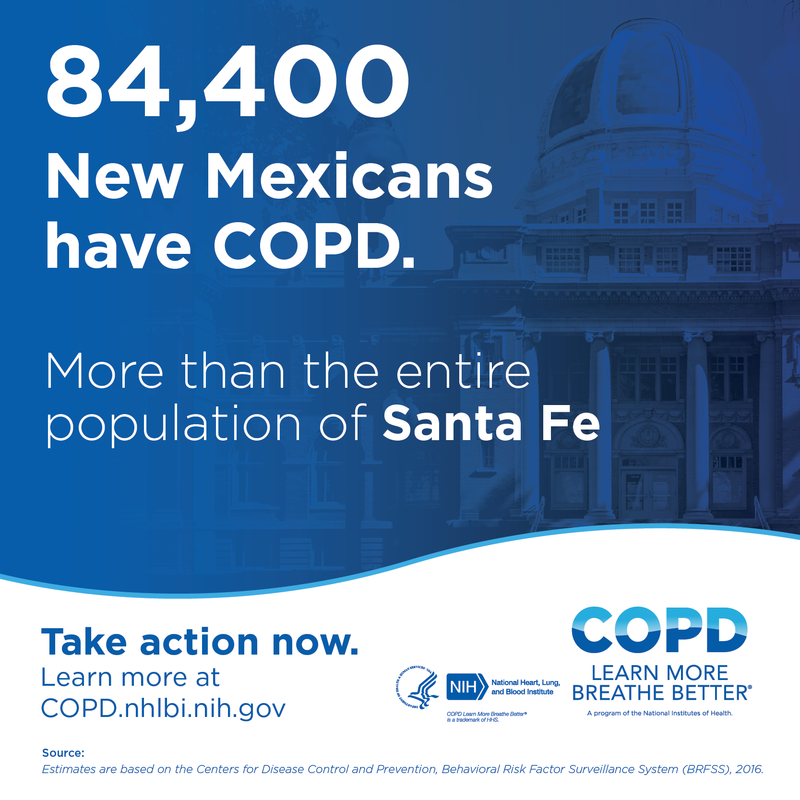 84,400 New Mexicans have COPD. More than the entire population of Santa Fe. Take action now. Learn more at copd.nhlbi.nih.gov. 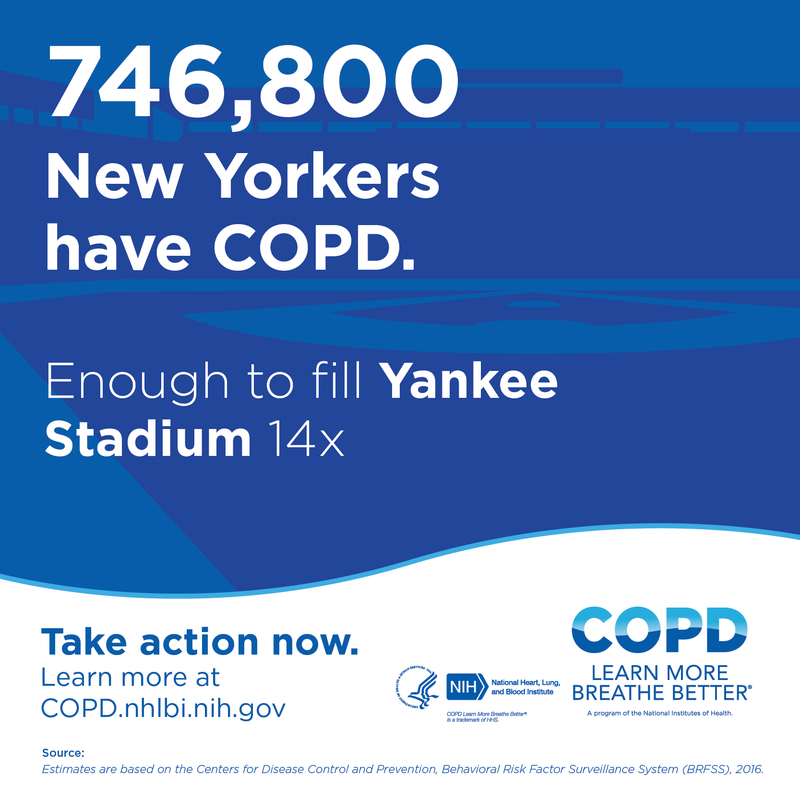 746,800 New Yorkers have COPD. Enough to fill Yankee Stadium 14x. Take action now. Learn more at copd.nhlbi.nih.gov. 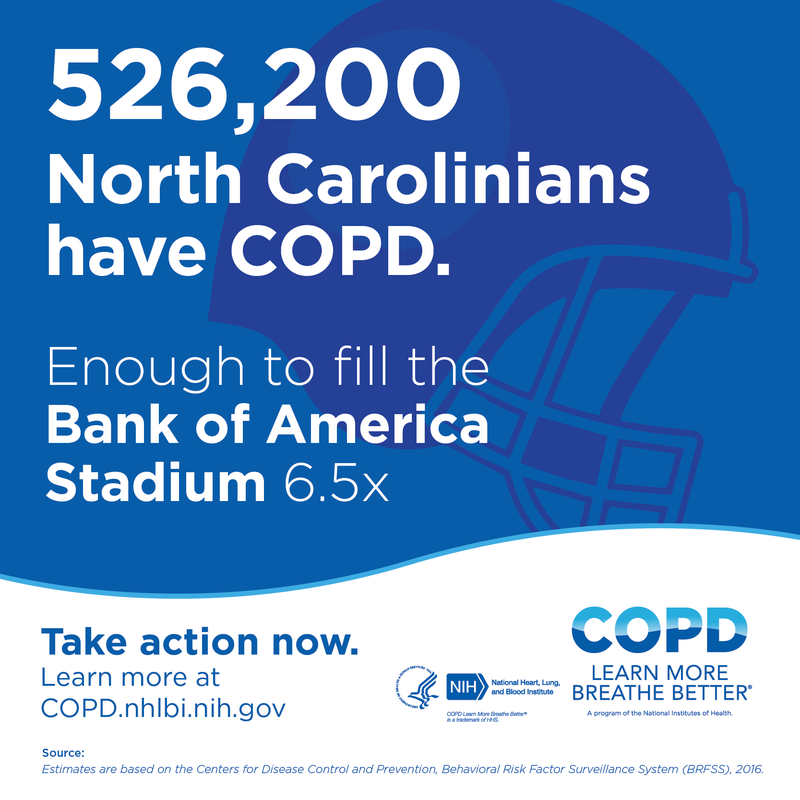 526,200 North Carolinians have COPD. Enough to fill the Bank of America Stadium 6.5x.Take action now. Learn more at copd.nhlbi.nih.gov. 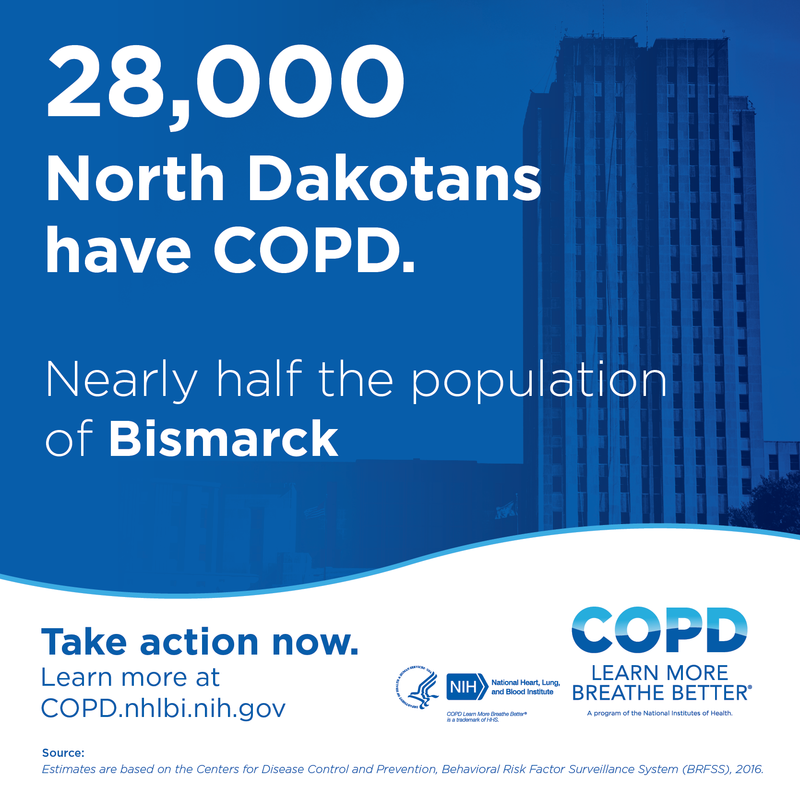 28,000 North Dakotans have COPD. Nearly half the population of Grand Forks. Take action now. Learn more at copd.nhlbi.nih.gov. 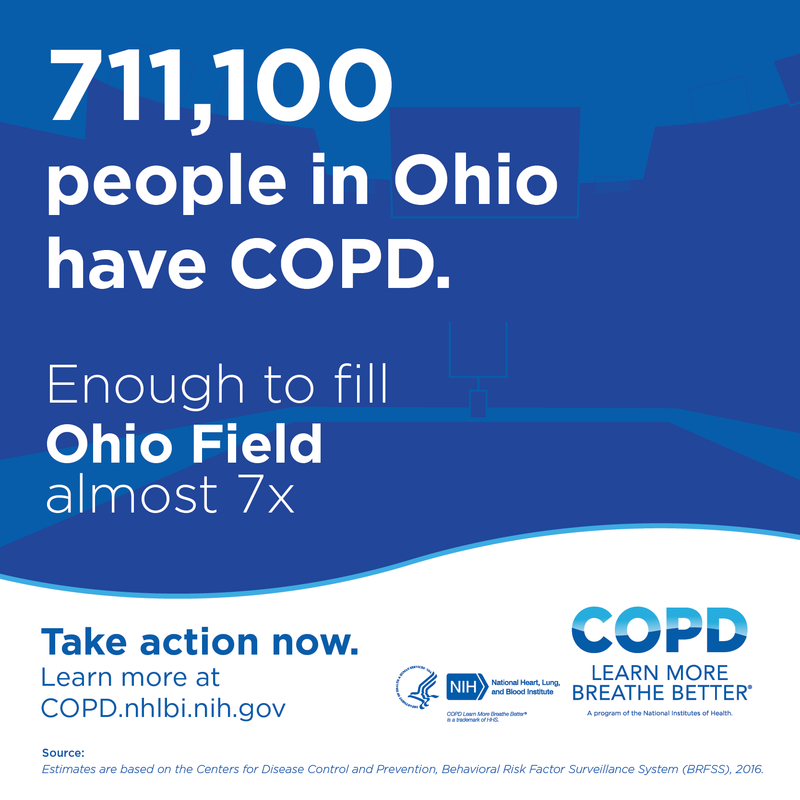 711,100 people in Ohio have COPD. Enough to fill Ohio Field almost 7x. Take action now. Learn more at copd.nhlbi.nih.gov. 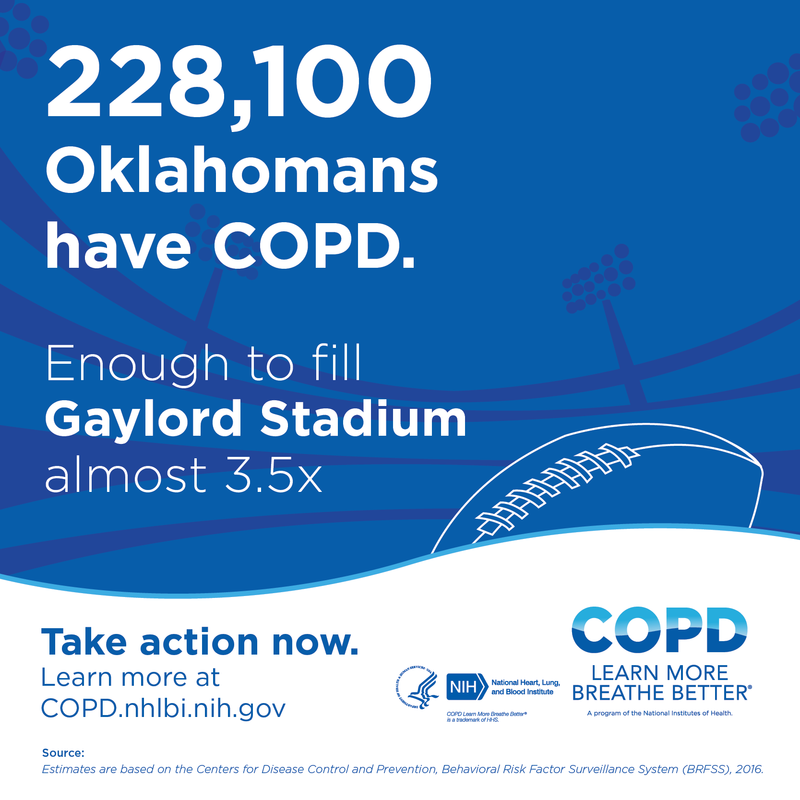 228,100 Oklahomans have COPD. Enough to fill Gaylord Stadium almost 3.5x. Take action now. Learn more at copd.nhlbi.nih.gov. 196,800 Oregonians have COPD. Enough to fill Autzen Stadium more than 3.5x. Take action now. Learn more at copd.nhlbi.nih.gov. 677,500 Pennsylvanians have COPD. 2x the population of Pittsburgh. Take action now. Learn more at copd.nhlbi.nih.gov. 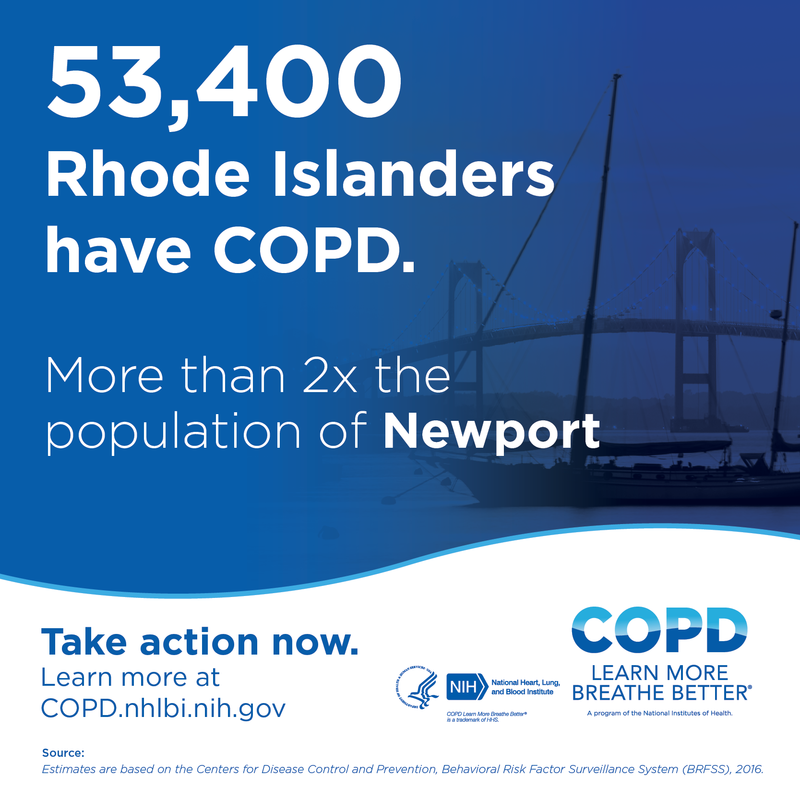 53,400 Rhode Islanders have COPD. More than 2x the population of Newport. Take action now. Learn more at copd.nhlbi.nih.gov. 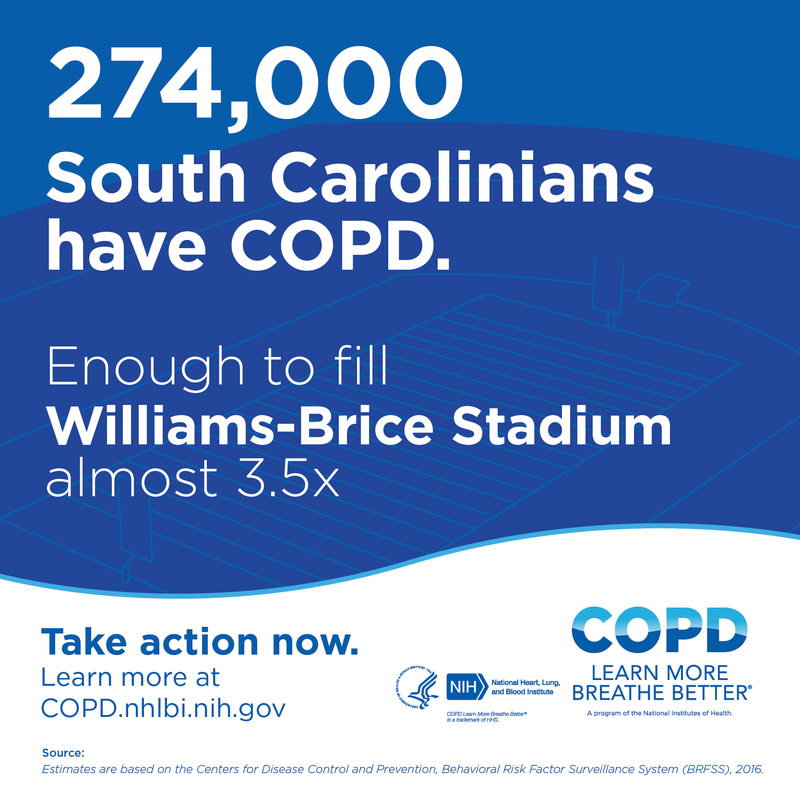 274,000 South Carolinians have COPD. Enough to fill Williams-Brice Stadium almost 3.5x. Take action now. Learn more at copd.nhlbi.nih.gov. 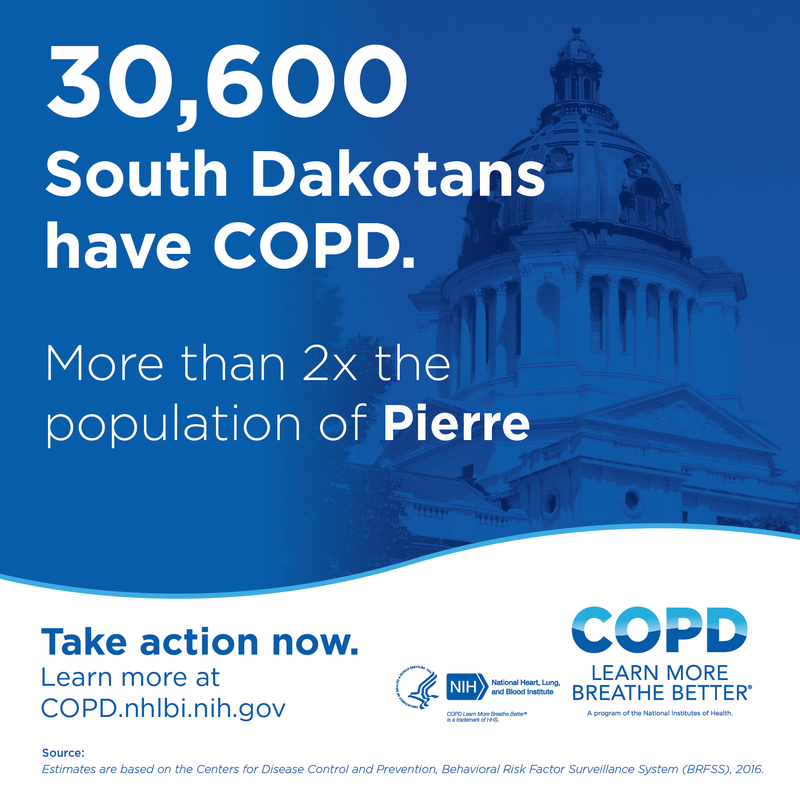 30,600 South Dakotans have COPD. More than 2x the population of Pierre. Take action now. Learn more at copd.nhlbi.nih.gov. 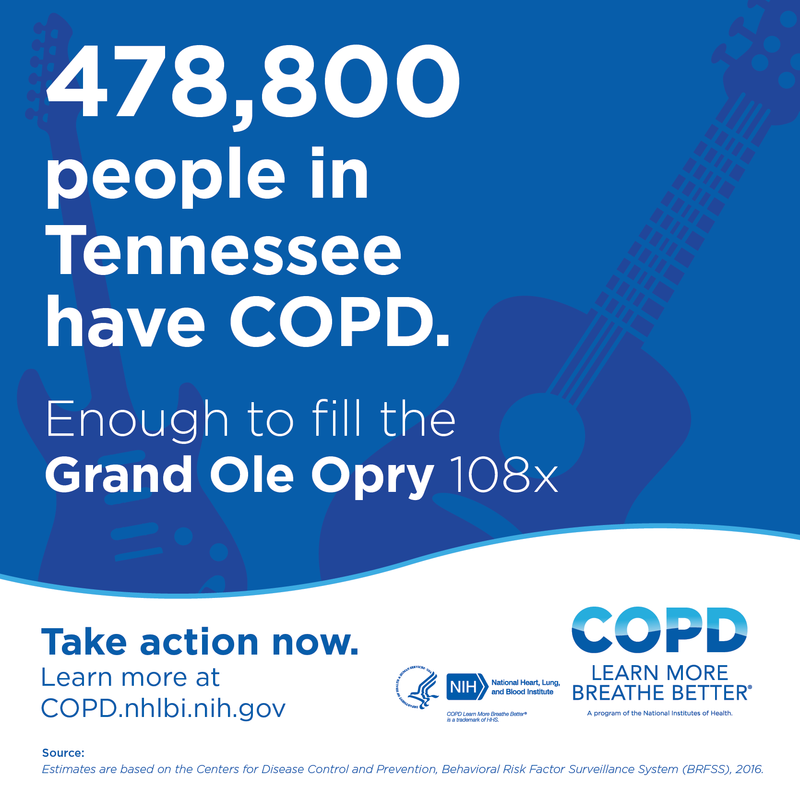 478,800 people in Tennessee have COPD. Enough to fill the Grand Ole Opry 108x. Take action now. Learn more at copd.nhlbi.nih.gov. 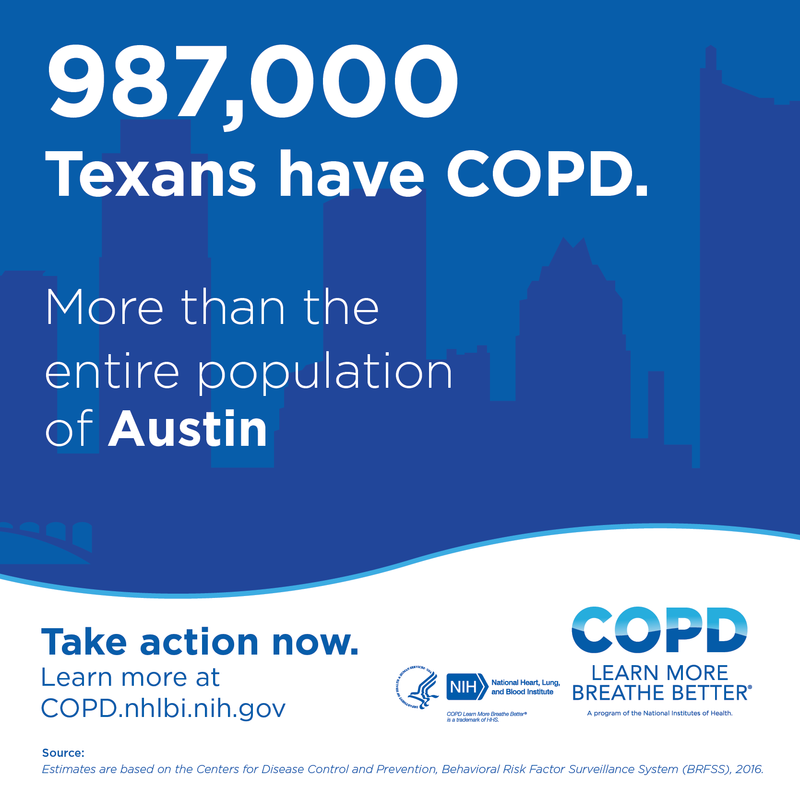 987,000 Texans have COPD. More than the entire population of Austin. Take action now. Learn more at copd.nhlbi.nih.gov. 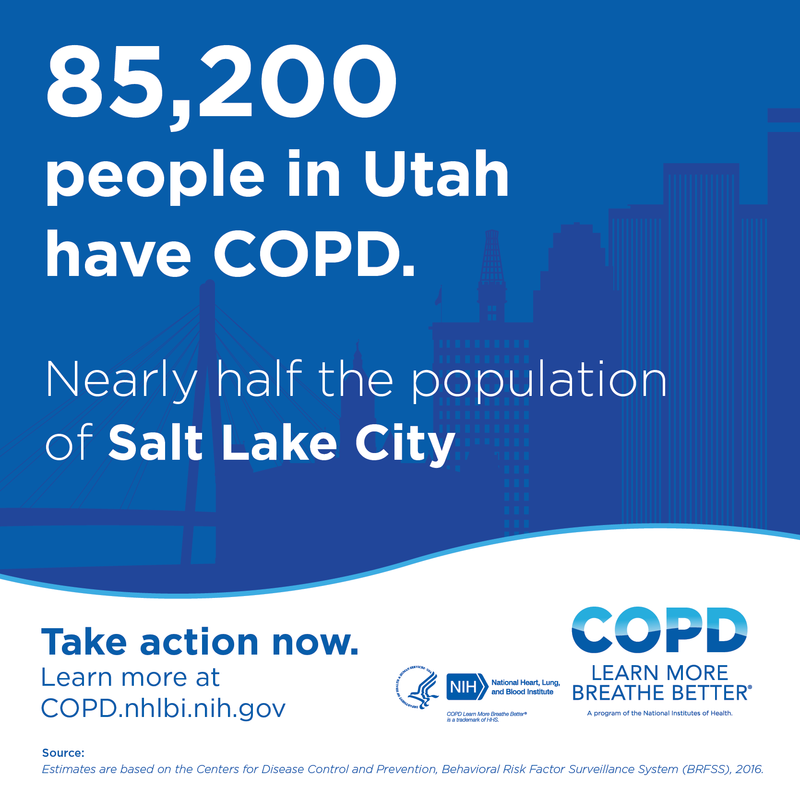 85,200 people in Utah have COPD. Nearly half the population of Salt Lake City. Take action now. Learn more at copd.nhlbi.nih.gov. 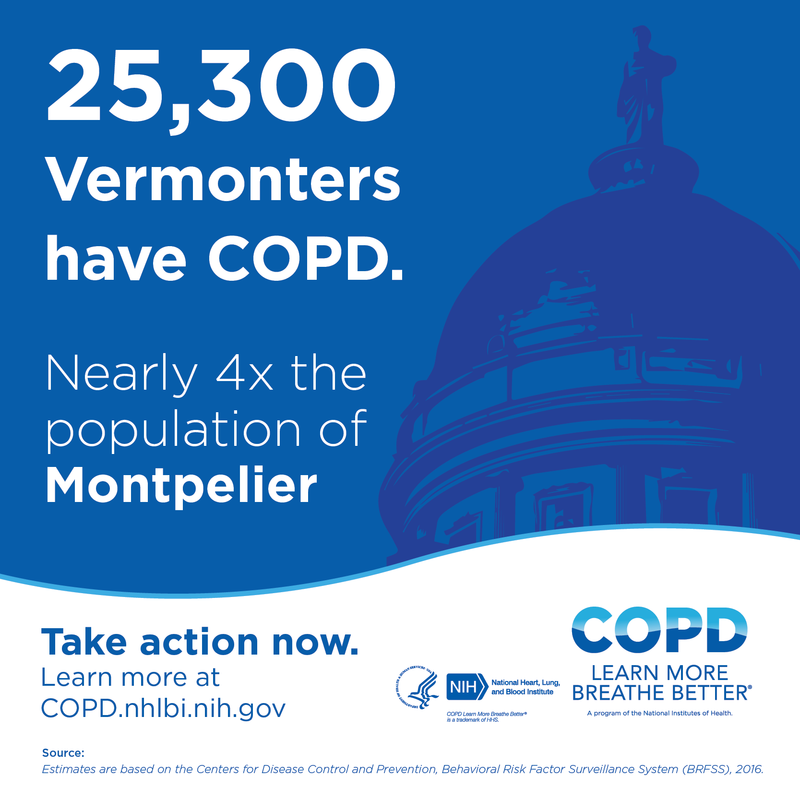 25,300 Vermonters have COPD. Nearly 4x the population of Montpelier. Take action now. Learn more at copd.nhlbi.nih.gov. 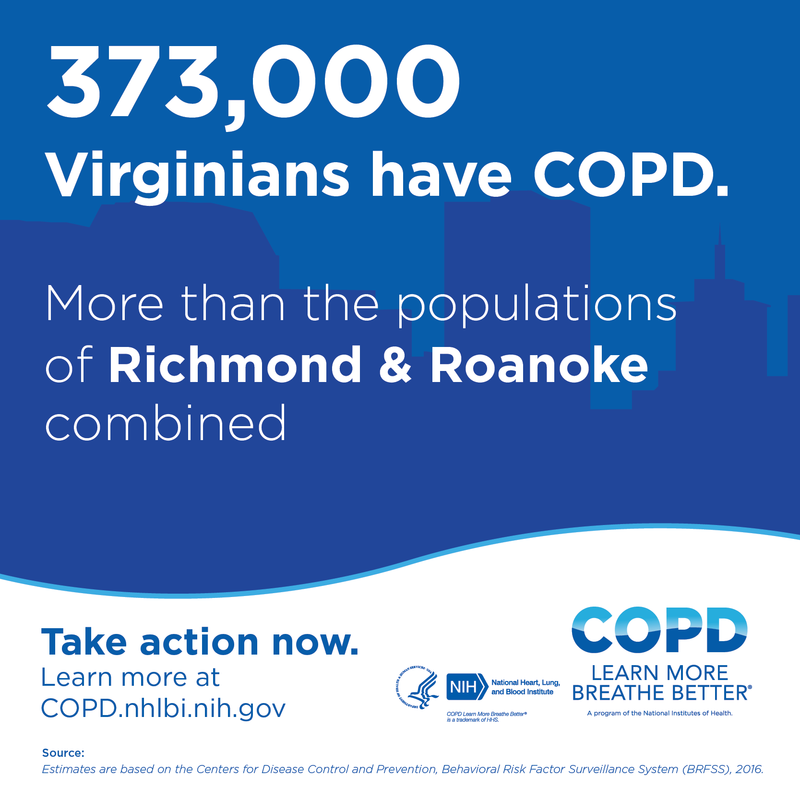 373,000 Virginians have COPD. More than the populations of Richmond & Roanoke combined. Take action now. Learn more at copd.nhlbi.nih.gov. 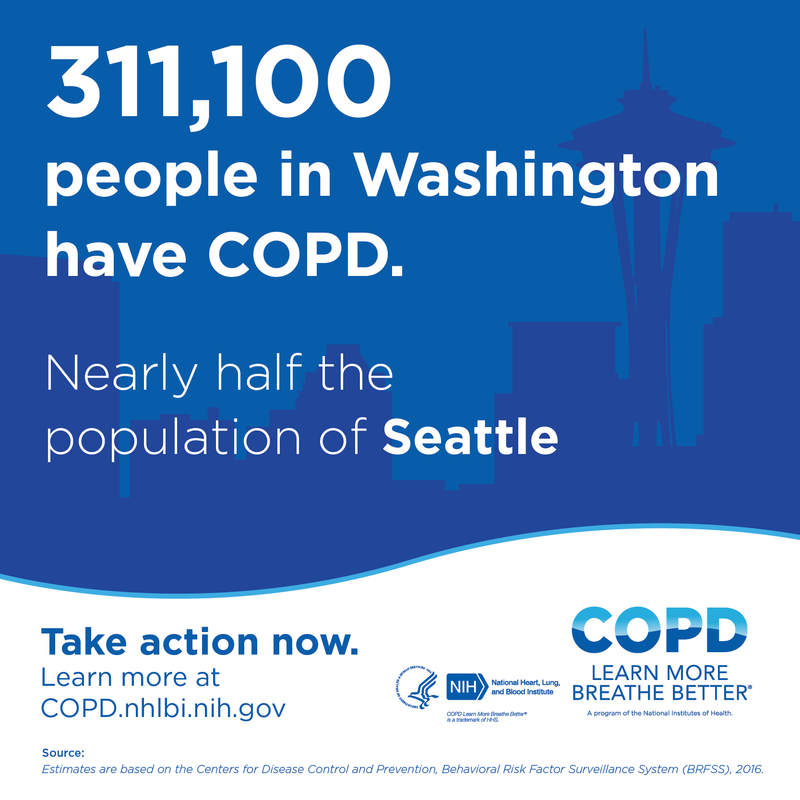 311,100 people in Washington have COPD. Nearly half the population of Seattle. Take action now. Learn more at copd.nhlbi.nih.gov. 180,300 West Virginians have COPD. More than 3.5x the population of Charleston. Take action now. Learn more at copd.nhlbi.nih.gov. 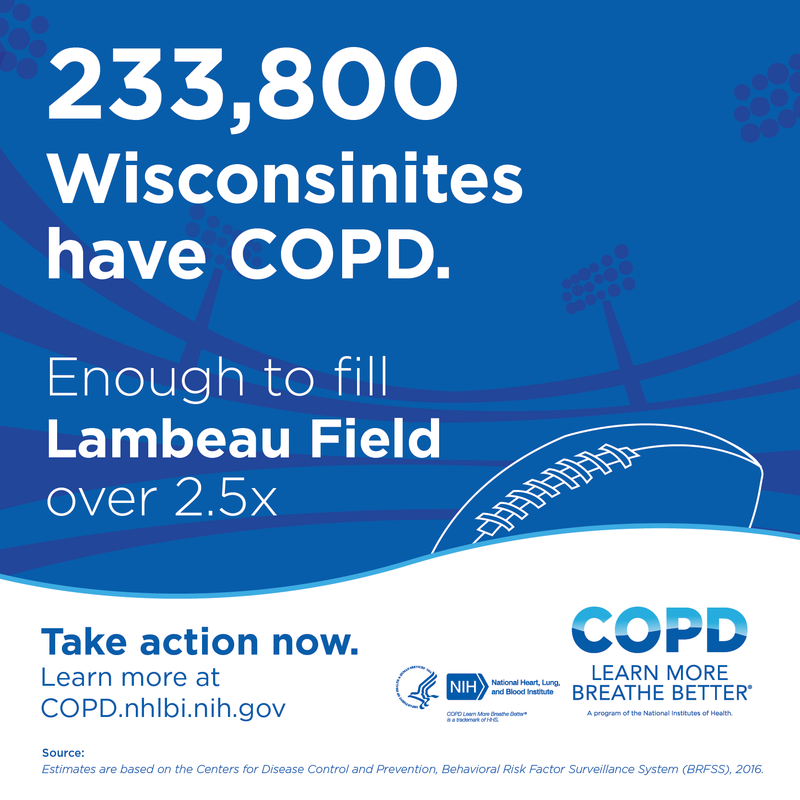 233,800 Wisconsinites have COPD. Enough to fill Lambeau Field over 2.5x. Take action now. Learn more at copd.nhlbi.nih.gov. 29,300 Wyomingites have COPD. Nearly half the population of Cheyenne. Take action now. Learn more at copd.nhlbi.nih.gov.